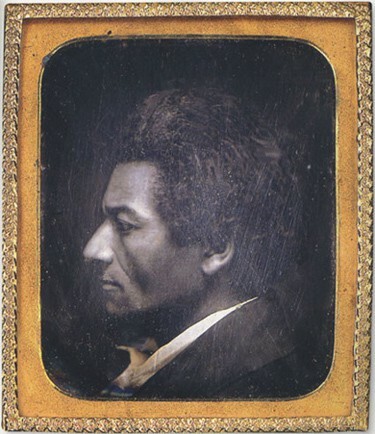 This 1/4 plate daguerreotype by an unknown artist is unique in its composition, showing an intimate image of Douglass’s profile. Taken in 1850, the profile view of this portrait gives Douglass an additional air of sophistication. It seems to harken back to the black and white silhouettes of the 18th and early 19th centuries, when wealthy and middle class families commissioned their likenesses to be cut or drawn using a black figure on a white background. Even though Douglass’s black hair, black skin, and black overcoat are placed against a black backdrop in this portrait, his earnest expression and stately demeanor shine through.